72% of Republicans said the probe is mostly an effort to discredit Trump and should be ended. 76% of Democrats said the investigation should continue. On whether Trump’s campaign colluded with Russia, voters’ views haven’t changed since June. 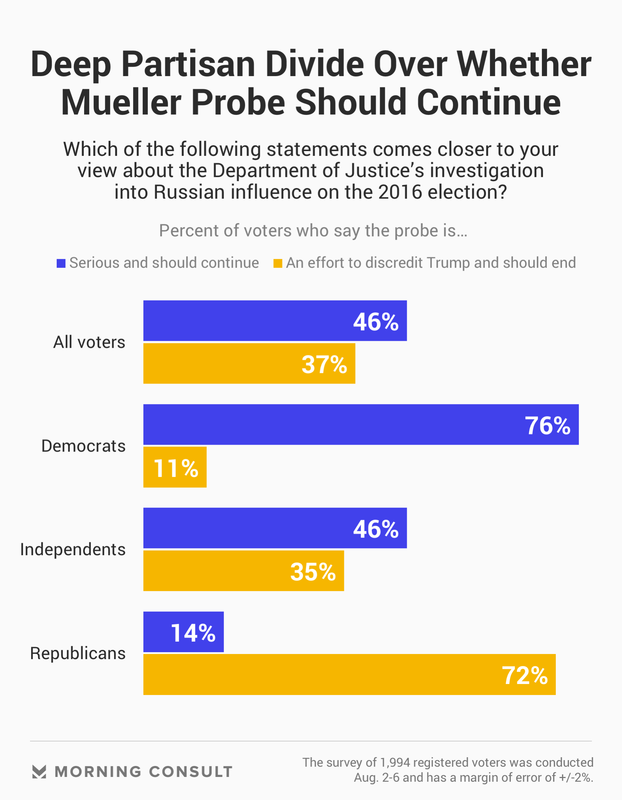 But a plurality of voters– 46 percent – say the probe is a mostly serious matter and should continue, according to a new Morning Consult/Politico poll, while 37 percent said it should be stopped. Nearly half of the 1,994 registered voters in the poll – 49 percent – think Trump tried to impede or obstruct the Mueller investigation, about the same as when voters were asked the same question in June. The latest survey, conducted Aug. 2-6, was taken after Trump posted his call to end the investigation. Overall, voters are split over whether the DOJ’s probe has been handled fairly, as they were when asked two months ago, with 39 percent in the latest poll saying the investigation has been fair and 37 percent saying the opposite. The survey’s margin of error is 2 percentage points. When asked whether the Trump campaign colluded with Russia – which the president has denied – voters’ views have also not changed since June. In the latest survey, 42 percent of voters said they thought Trump’s campaign worked with Russia to influence the outcome of the 2016 election, while 39 percent said he did not. Seventy-two percent of Republicans in the August survey said the Department of Justice investigation is mostly an effort to discredit the president and should be ended. The same share said Trump has not tried to impede or obstruct the probe. Those numbers flip for Democrats, 76 percent of whom said the investigation should continue, and even more – 82 percent – said Trump has tried to impede or obstruct the Russia investigation.